Border Fair Housing and Economic Justice Center educates low-income consumers on access to credit and predatory lending practices. 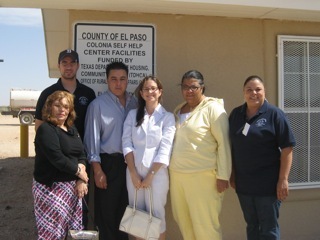 Consumer Action’s Sol Carbonell and Audrey Perrott visited Texas’s Border Fair Housing and Economic Justice Center (BFHC) to learn more about their efforts to improve the quality of life of colonia residents. According to the Texas Secretary of State, approximately 400,000 Texans live in colonias, or unincorporated communities and neighborhoods that are scattered along the border. Colonias often lack some of the most basic living necessities, such as potable water and sewer systems, electricity, paved roads, and safe and sanitary housing. The colonia population is predominately Hispanic and residents generally have very low incomes. Homes are generally built by their owners and lack electricity, plumbing and other basic amenities. 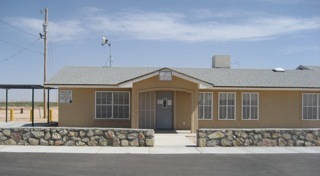 BFH is a private, not-for-profit civil rights organization dedicated to affirmatively furthering fair housing, equal access to credit, economic justice, the development of decent and affordable housing, community development and expanding small business opportunities in the colonias and communities in the Southwest United States. BFH is the result of a collaborative effort of various local and national leaders to end discriminatory practices in the area, including the National Community Reinvestment Coalition. To address the need for affordable housing in colonias, BFHC partnered with the County of El Paso to operate one of several Colonia Self Help Centers, which are funded by the Texas Department of Housing & Community Affairs in the Border. Anibal Olague, Executive Director of BFH and Pilar Provencio, Environmental Justice Program Coordinator, provided Carbonell and Perrott with a tour of the Agua Dulce Self Help Center, which offers colonia residents with training on building and rehabilitating their homes, accessing loans and grants for construction material, accessing construction equipment through a tool lending library, as well as consumer education on Fair Housing and predatory lending. BFH’s Consumer Protection Initiative is an integral part of preventing abuses by promoting economic justice along the U.S.-Mexico border, where a lack of education coupled with widespread systemic poverty has made many residents a target for predatory lenders. Through its certified mediators and counselors, BFH helps consumers make better choices by providing counseling on recognizing predatory lending issues through educational workshops as well as informing them of their rights under federal, state, and local consumer protection laws. BFH staff recently attended Consumer Action’s MoneyWi$e regional meeting, a two-day train-the-trainer conference hosted in Houston focusing on educating community agencies on financial literacy issues. Consumer Action’s free materials and fact sheets in English and Spanish will be utilized to reach out to colonia residents and educate them on basic personal banking services, improving their credit and avoiding predatory lenders and scams.